We’ve also added a MIDI Out jack (and included the cables for you) that lets you easily chain and control your outboard MIDI gear. 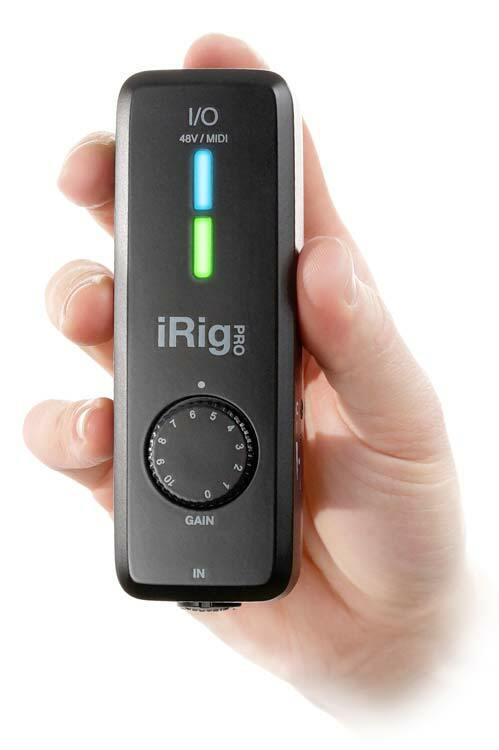 iRig Pro I/O has multiple power options depending upon your recording preferences. 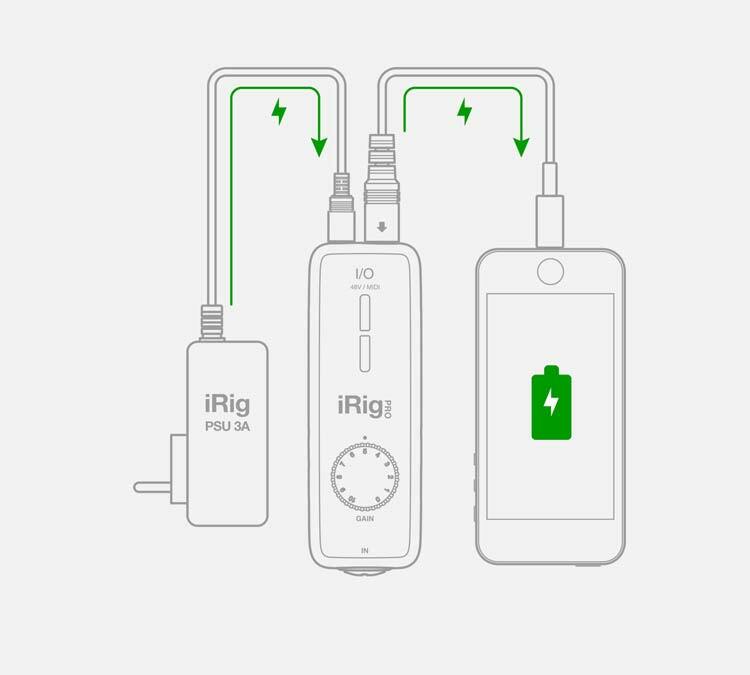 When used as a standalone interface for iPhone, iPad or Android device, you can power iRig Pro I/O with 2 – AA batteries that also provide switchable 48V phantom power for condenser mics. When use with iRig PSU 3A*, the optional DC PSU, iRig Pro I/O will charge your iPhone or iPad while plugged in for endless or extended recording and playing sessions. Buy now the iRig PSU 3A! * When used with a Mac/PC, iRig Pro I/O gets its power from the USB port and the connected laptop. Whichever method you choose, iRig Pro I/O will adapt and is ready to go at a moment’s notice. iRig Pro I/O comes with over $/€550 worth of full version IK Software including AmpliTube for iOS, AmpliTube 4 for Mac/PC, SampleTank 3 SE, T-RackS Deluxe with Mic Room, and more. No other interface gives you so much value and playability right out of the box. With iRig Pro I/O and IK Software, there’s no limit to what you can do. * Use only the specified AC adaptor Use only the specified AC adaptor (iRig PSU 3A) and make sure the line voltage at the installation matches the input voltage specified on the AC adaptor's body. IK Multimedia will not be responsible of any damage caused by usage of any AC adaptor other than the specified one (iRig PSU 3A). The usage of AC adaptors other than the specified one (iRig PSU 3A) could compromise the user experience in terms of: Safety risk, Apple device charging performances, Noise performances. 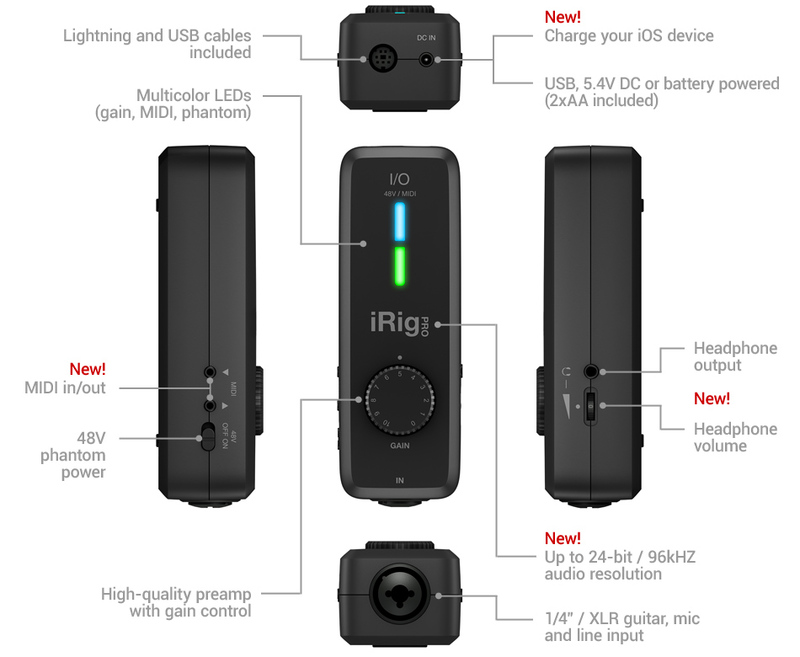 iRig® Pro I/O is a registered trademark property of IK Multimedia Production Srl. All other product names and images, trademarks and artists names are the property of their respective owners, which are in no way associated or affiliated with IK Multimedia. Product names are used solely for the purpose of identifying the specific products that were studied during IK Multimedia’s sound model development and for describing certain types of tones produced with IK Multimedia’s digital modeling technology. Use of these names does not imply any cooperation or endorsement. iPhone®, iPod touch®, iPad®, GarageBand®, Mac® and the Mac logo are trademarks of Apple Computer, Inc., registered in the U.S. and other countries. App Store is a service mark of Apple Inc. Android is a trademark of Google Inc.